Augmented unison? What on earth … ? More and more frequently these days I’m having to fight with the typesetting program Sibelius. My friends all use it, publishers use it and if I want to communicate with these people, I have to grit my teeth and use it too. The latest episode involved the aria ‘I know that my Redeemer liveth’ from Handel’s Messiah, which our soloist is to sing on Easter Sunday. She sings it in the correct key of E major, and has provided me with the accompaniment. All would have been well, except that my organ-voluntary version of this piece is stupidly in E flat major (but that’s another story). At this short notice I couldn’t trust myself not to revert unthinkingly to three flats and wreck the poor lady’s solo. What to do? Eventually we decided that she would sing it in E flat major, and I undertook to scan the four-sharps version into Sibelius and transpose it down a semitone. 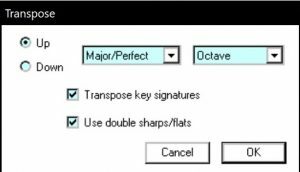 And here’s the transposing menu, which offers up/down buttons and drop-down intervals. So I click on the ‘down’ button, choose ‘Minor’ and ‘Second’ for the interval. Click OK. And … what the dickens is this? The darned thing has gone into D sharp! With a three-flat key-signature and double sharps galore! What a mess. I go back and try again two or three times. No improvement. Finally, I dig out the manual. Now I hate this manual for many, many reasons, one of which is that it won’t stay open, even under two huge paperweights. After physically wrestling with it for a bit, I find there is a transposition ‘particular case’ (p 536). To transpose by a semitone, you have to invoke an interval called an ‘augmented unison’. Augmented unison? That has to be a contradiction in terms. Surely unison is simply unison. You can’t do anything to a unison interval without turning it into something else. Unless Sibelius is inventing – er – quantum tonality? … and it works, which is a relief. But still, you’d think they could do better than that. Methinks I shall have to widen my typesetting horizons.